1) Warm-based. A warm based glacier contains a small portion of water (.1% to 4%) in addition to ice, this water extending throughout the entire volume (the top few metres might freeze solid in winter). The water resides in voids and at crystal grain boundaries. The temperature of a warm-based glacier is stabilized at the precise pressure-melting point of ice by the large heat of crystallization associated with the water/ice phase transition. 2) Cold-based. A cold based glacier has been exposed to sub-zero seasonally-averaged weather conditions for a long enough time to freeze all included water. Without the thermal stabilizing effect of the water/ice transition, the temperature of a cold-based glacier can decline arbitrarily. 3) Polythermal. A polythermal glacier is warm-based in parts and cold-based elsewhere. The contact between a warm-based glacier and underlying bedrock is lubricated by liquid water. Furthermore, the temperate ice of a warm-based glacier is subject to very rapid creep and/or pressure melt/refreeze when exposed to concentrated stress. 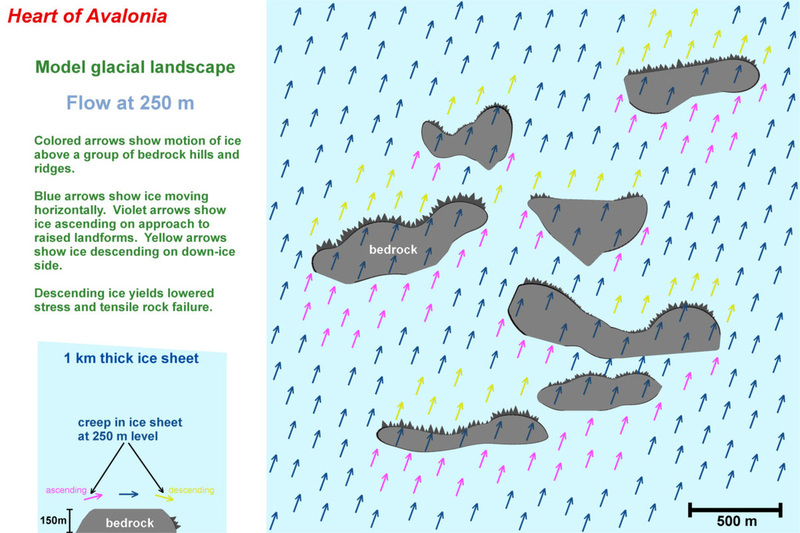 Temperate ice can therefore slide easily over bedrock, deforming rapidly as needed to accommodate surface irregularities. This sliding of temperate ice over bedrock constitutes basal slip. Basal slip erodes bedrock when particles of rock are broken loose by moving ice. These particles then serve as an abrasive medium to rapidly erode additional rock further downstream. The process is illustrated in the diagram below. When the stress due to ice loading is compressional, basal slip erosion tends to produce smooth, streamlined bedrock landforms. These eroded landforms are indicative of warm-based glaciation and provide evidence that climatic conditions conducive to the presence of temperate ice existed, at least during the late stages of glaciation. Very large volumes of bedrock can be stripped off by fast-moving warm-based glaciers. Thus, basal slip erosion "resets the clock" on a sequence of glacial erosion events, erasing evidence of preceding erosion episodes that might have taken place under different conditions. Following are some photos showing bedrock surfaces carved out by basal slip erosion. The following photos illustrate the role played by abrasive particles in allowing ice, which is very soft compared to most minerals, to efficiently carve large volumes of bedrock. The above photo shows a 5 m long stretch of bedrock, eroded by basal slip glaciation. Abundant deep grooves have been etched into the fine-grained volcanic bedrock by pebbles dragged along in the moving ice. The source of the pebbles is shown in the photo below. Immediately up-ice from the glacially-grooved bedrock, a ridge of large-clast ignimbrite was eroded, releasing clasts that were harder than matrix, into the ice stream. The exposure shown above is about 30 cm wide. This special set of circumstances created the very abundant and distinct grooves. Plucking (also called quarrying) is a bedrock glacial erosion process that occurs in areas where the effective stress regime is tensile. Tensile stress arises in bedrock not because ice "sticks" to rock and drags it along, bur rather because pressurized glacial meltwater enters joints or pores in the rock. When groundwater pressure exceeds ice loading, the affected rock will fail in tension. Plucking can occur during warm-based glacial ice movement over and around bedrock obstructions, or, more generally, whenever ice movement creates a tensile stress regime. The illustration below shows the concept of plucking in its most basic form. The diagram uses pressure melting as an example of how hydraulic stress can be transferred through bedrock to yield tension in the rock on the down-ice side. However, pressure melting is not crucial to the plucking process. The groundwater could remain liquid in the rock simply because of a temperature gradient, or because of the Gibbs-Thomson effect whereby the freezing point is depressed by surface effects in a pore space. Similarly, ice segregation or simple hydraulic pressure could break the down-ice rock, rather than the illustrated process of expansion-upon-freezing. Plucking is potentially the source of glacial erratics and large amounts of till, especially when the process accompanies fast-moving basal-slip glaciation. Understanding plucking and figuring out the conditions under which it occurred is essential in interpreting field observations presented in this section (Frost heaved bedrock) of Heart of Avalonia. 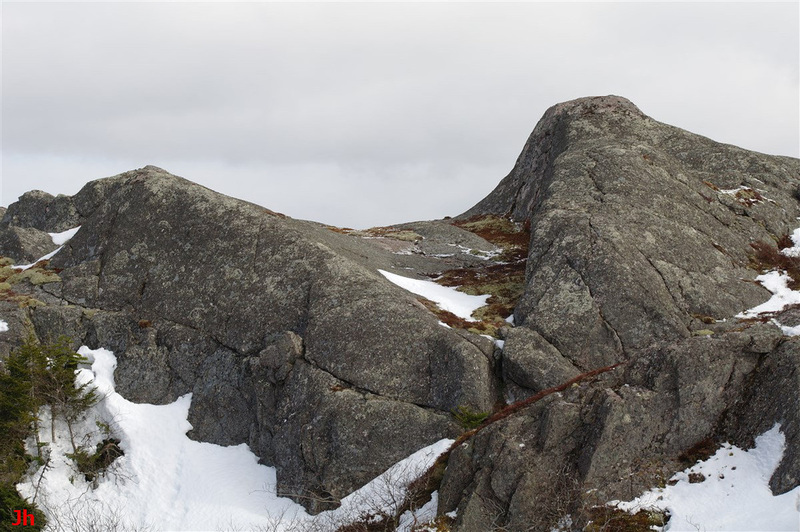 The photo above shows a roche moutonnee, or hill that has been streamlined by basal slip erosion (up-ice) and plucked (down-ice). 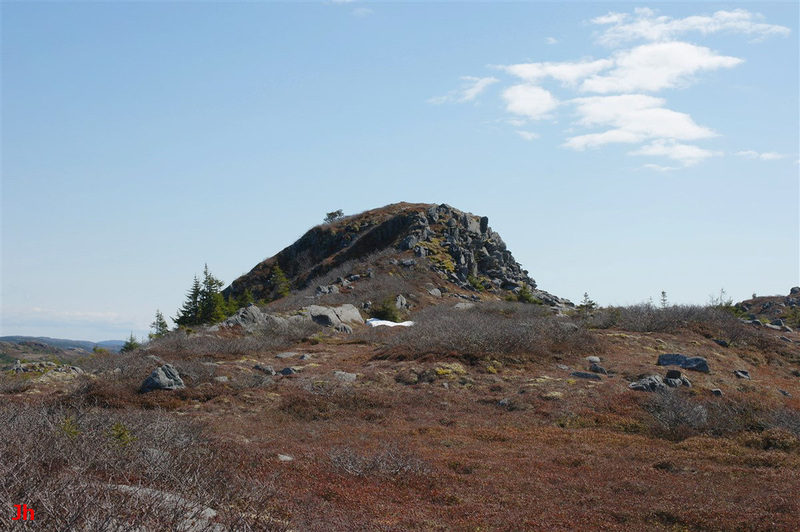 Close observation reveals that this hill, like many others on the Isthmus of Avalon, has also undergone other, more complex and difficult to interpret, glacial or periglacial erosion processes. Cold-based glaciers move only by ice creep and will not carve out smooth streamlined landforms such as are formed by basal-slip erosion. The motion of cold-based ice over bedrock more closely resembles the flow of a viscous fluid, governed by the conventional laws of fluid dynamics. In particular, flow velocities reach zero at the ice-rock interface. This condition is often described as having the ice frozen onto the rock surface, but in reality ice creep can occur along or away from a rock surface, given appropriate stress conditions. The diagram below contrasts the motion of warm-based ice over bedrock with the motion of cold-based ice. Note that in the above diagram, the color bars indicate fixed sections of ice, and their re-positioning shows the ice movement. Also, it should be noted that the basal-slip process allows much faster ice movement than does the ice-creep process. In general terms, cold-based glacial erosion would be expected to move less rock per unit time than warm-based erosion because total ice movement is slower, and what movement does occur is preferentially remote from the ice-rock interface. Analyzing the details of cold-based glacial erosion in the field, however, might prove more readily feasible than analyzing basal-slip erosion precisely because the products of the erosion have moved less. Bedrock containing extensive water-filled joint systems (frozen or unfrozen) can theoretically move in response to stress similarly to cold-based glacial ice (see Bedrock Glacier model). The diagram below illustrates the concept of bedrock fragmentation accompanying creep of cold-based glacial ice. The process illustrated above closely resembles warm-based glacial plucking (described previously in this section) and can be regarded as a form of creep-driven plucking that occurs under cold-based glacial conditions. How is it possible to recognize cold-based glacial plucking from plucking that occurred in a warm-based glacial environment? There is probably no sure way. However, very small amounts of maximum rock displacement (a few centimetres, metres or tens of metres) is suggestive of a cold, creep dominated environment. Also, the direction of rock displacement can sometimes indicate that ice movement in the area was by creep, not basal slip. Basal slip motion would tend to follow the contours of the topography, guided along valleys and around obstructions. Creep motion would tend to ignore topography and follow whatever path leads to the most rapid drop in elevation. This concept is illustrated in the following diagram. ​The following two photos illustrate disrupted bedrock landforms indicative of cold-based glacial erosion. 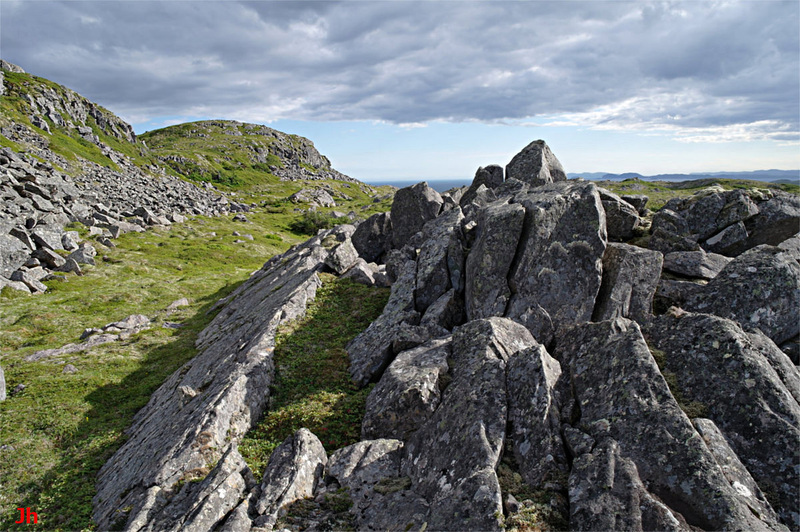 In the top photo (hill 15 m high), widened joints (near top) are seen giving way to tipped joint blocks (middle) and then to a talus field resembling a relict rock glacier. This pattern of rock displacement is compatible with a creep-dominated glacial erosion environment. The bottom photo shows a small ridge (4 m high) initially carved from bedrock by basal slip erosion (note flattened and smoothed front face). Subsequent to the basal slip erosion, the ridge was displaced rightward and fragmented by ice loading. This ridge was studied in detail and an attempt was made to "reconstruct" the original unbroken ridge by looking at the shapes of the blocks and figuring out how they originally fitted together. It was determined that this disrupted bedrock landform was originally monolithic and that its present components are distributed in a gently diverging creep-flow pattern. The results of the analysis of this particular landform are presented as Illustrative Feature 07 in the Frost-heaved Bedrock field observations section.